How can I edit e-mail templates? How can I edit documents? 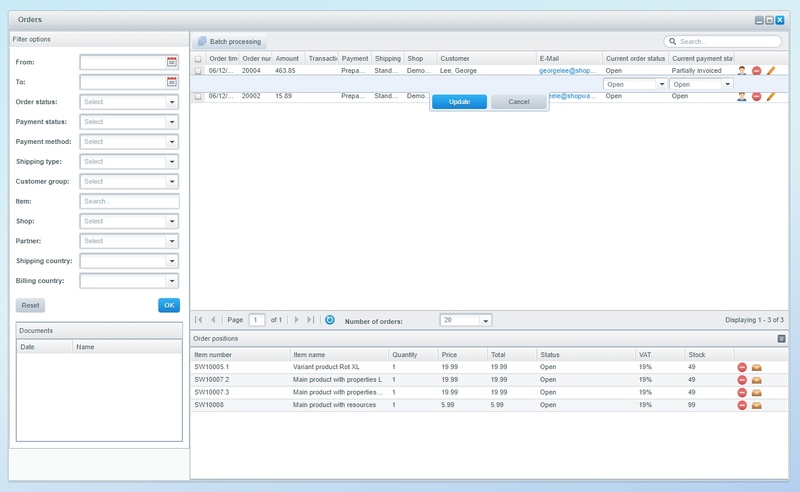 The purchase order module is located in Customers > Orders, here you can find all your shop's purchase orders and at the same time edit / process them. 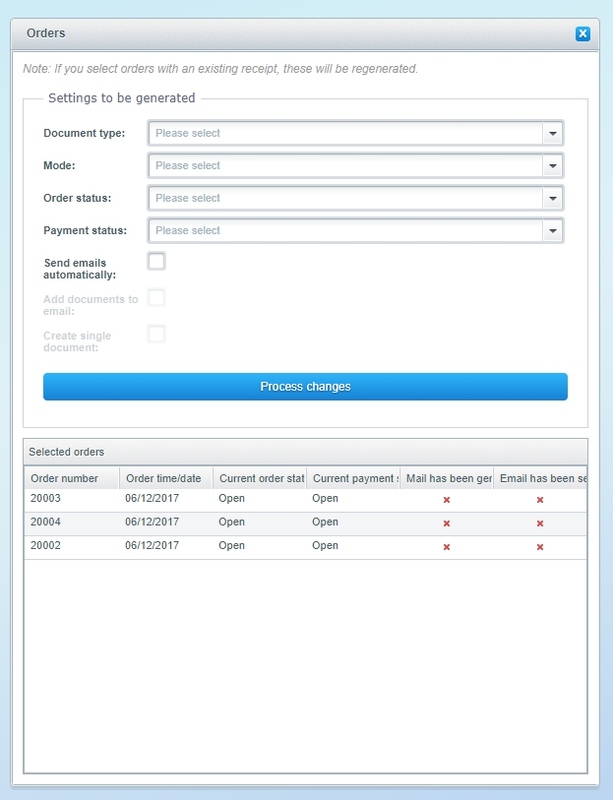 In the overview you have the possibility to filter (1) your orders by date, order status, payment status, payment method etc. to filter e.g. show all orders that are payed via PayPal or which have a specific payment state like "encashment". 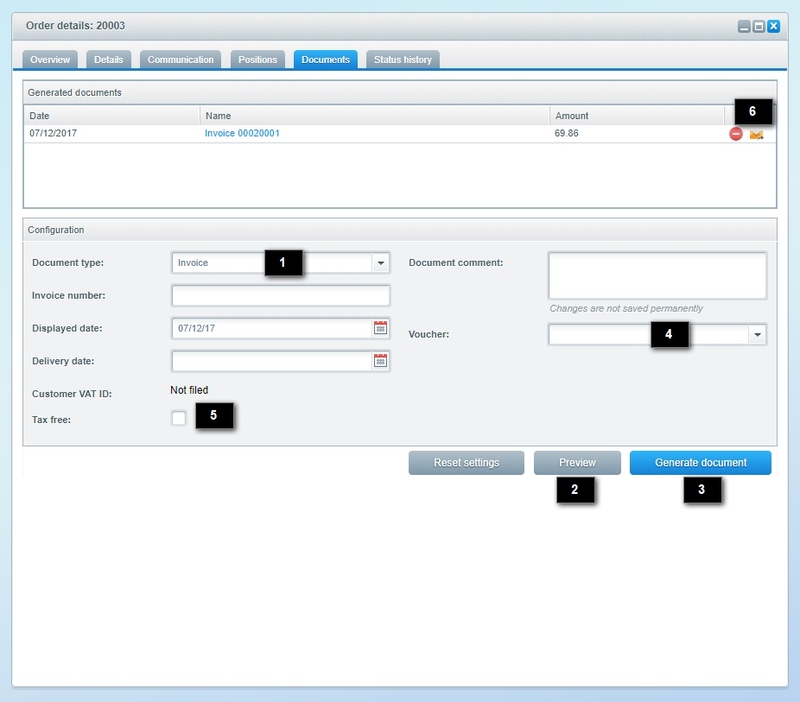 By using batch processing (2) you can process multiple orders at once to e.g. set the order state to "shipped" or create an invoice for all today's orders. Via the search field (3) you can search for specific orders using the order number, transaction number, name, e-mail or the customer number. With the option bar (5) you can flip between result pages, set the number of orders displayed per page and see a counter showing all orders registered in your shop. 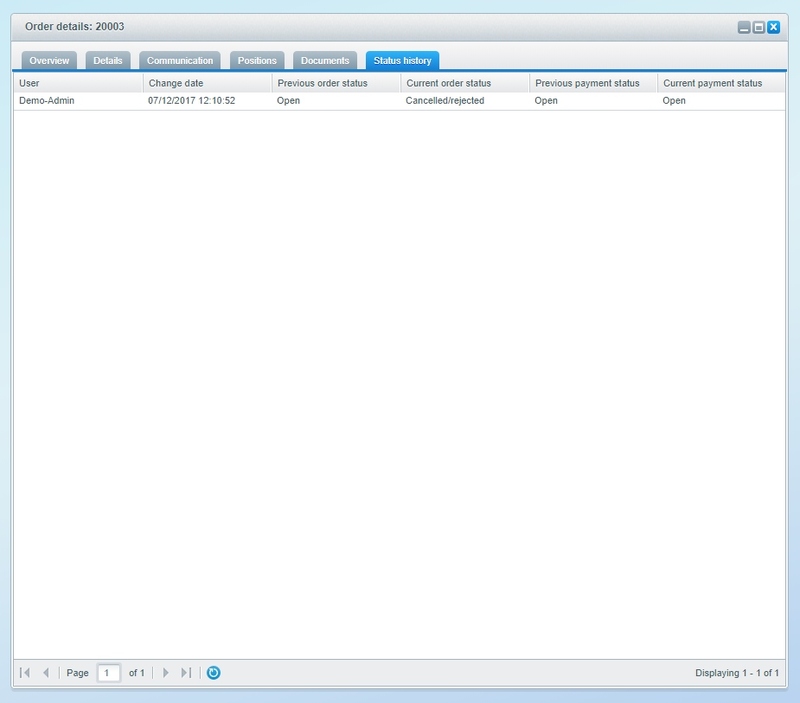 In the documents (7)-box on the left hand side you can see all the already created documents in the selected order. The main component of the module is the order list (4). Important information like date and time of order, order number, absolute order value, transaction number, payment method, shipping method, shop name, customer name, customer e-mail address and the current order- and payment states are directly displayed in the table. By clicking a column's header you can assort the corresponding values in an ascending or descending order. If you mark an order using the checkbox on the left, you can pop out the order positions (6) bar on the bottom of the window to see the items of the selected orders without having to separately open each individual order. The order status shows the actual state of the order. Possible pre-defined states are e.g. 'open', 'ready for delivery', 'partially-' or 'completely delivered'. Similar to the order state is the payment state option. It works just like the order state. Payments have possible states like 'completely invoiced', 'partially-' or 'completely paid', 'reminder' or 'encashment'. The payment state allows for a quick overview and lets you assess the current state of your orders. If you change a status, a pop-up will open, prompting you to e-mail your customers in order to inform them about the recent status change. At this point you can also add attachments (invoice, delivery note, credit advice or reversal invoice) to the customer update mail. When you are ready to send the e-mail, just click Send mail. Otherwise you can close the window at any time, in this case your customer won't receive an e-mail and will not be notified on the recent changes. You can open a certain order by clicking the pen-icon on the rightmost side of the particular row to access a detailed description of it. In the order details you can find all relevant data like invoice- and shipping address, payment method, details on order time, currency, device type and the language. Further you can set "paid on"-date, see the shipping costs and the order- and payment state and the free text fields. The field Referer is filled when the customer gets to your shop via an external page. The Partner-ID is filled when an active partner of your Affiliate program places an order. A tracking code can be used to notify the customer of the order's status. However, by default it will only be displayed on the customer's order details page in the frontend and will not have a hyperlink. If you want to know, how to link tracking information via the frontend or add a tracking link to an e-mail, take a look at the article Tracking numbers and tracking. In the details tab it is possible to edit the provided invoice- and shipping address as well as the payment- and shipping method. You can also see the order's free text fields, if set as active. 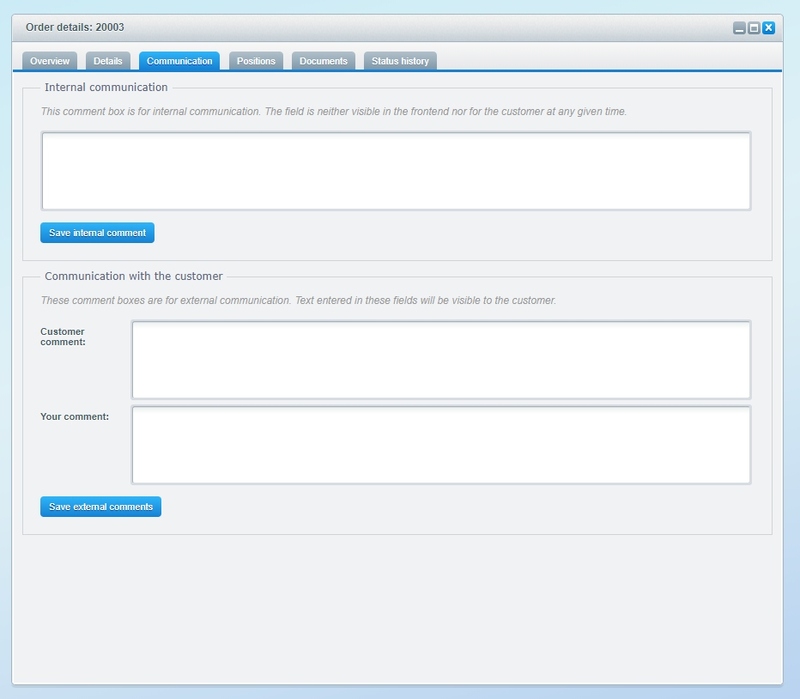 In the communication tab you can set-up internal comments regarding a certain order and read / answer customers comments. Internal comments can't be seen by the customer and are fit for internal use only. The field Customer comment contains the customer's comments. Those comments are requested at the customer's checkout, if the option "Display further notices" has been activated. The contents of the field Your comment will be visible on the customer's order details page in the frontend. You can find them in "My account > My orders" by opening an order. Here all ordered positions are listed. You can edit the positions afterwards and Add (1) or delete (2) a position. 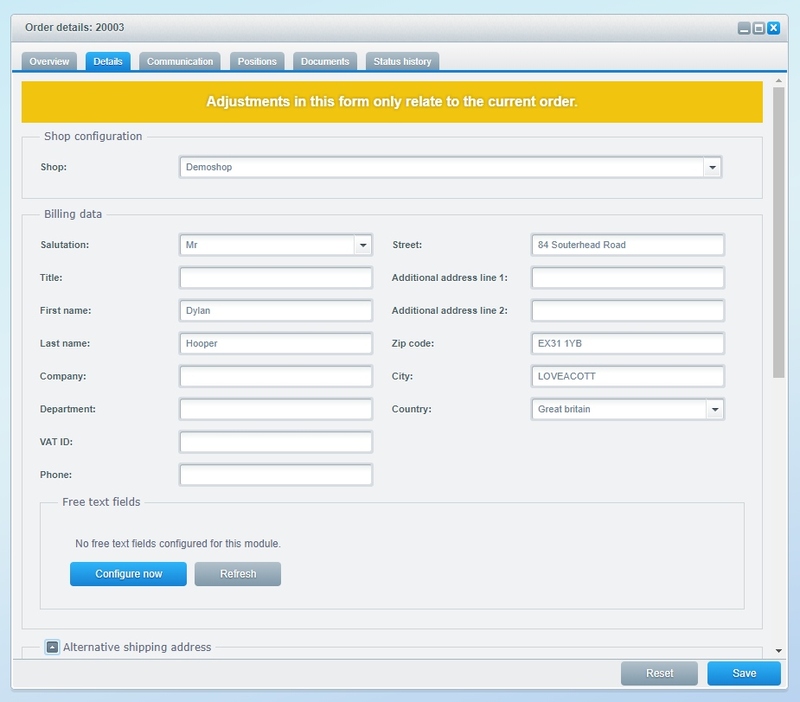 You can also edit the quantity or the product price by double-clicking the desired position. 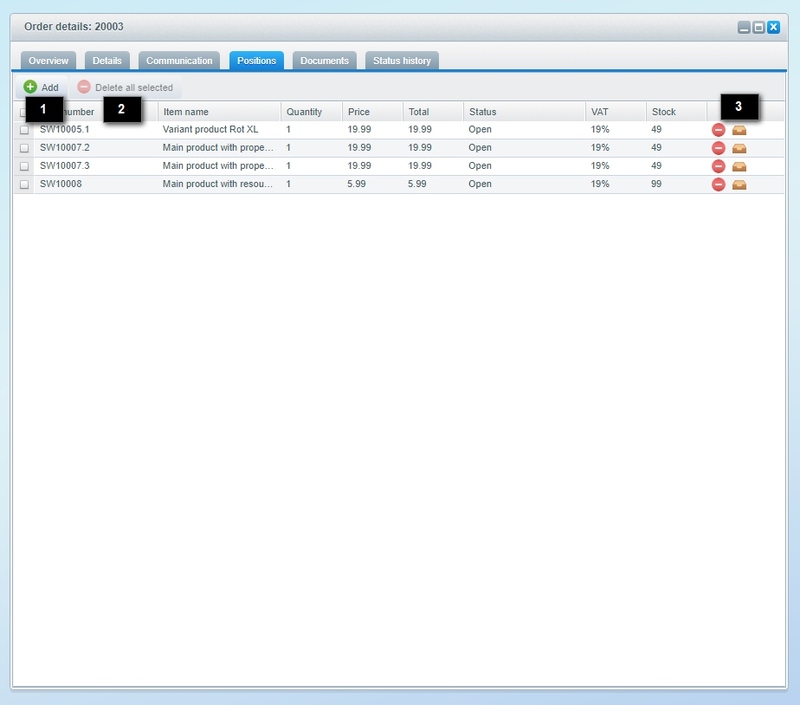 Using the action buttons (3) you can remove positions from the order or open the product detail window. To add a position, click Add (1), a new row will appear in the table, in which you can search for your product using the name or the order number of the product. Click Update to save the new position. Adding or removing products to an order afterwards won't update the products stock or shipping costs! Shopware comes with a built-in document creation tool, for conveniently generating invoices, delivery notes, credit advices or reversal invoices in the PDF-format. You can configure these documents in the basic settings tab located here: Documents. Under Preview (2) you can create a preview of the document, and then using Generate document (3) generate the document and automatically save it on the server. If desired, you can put additional information into the document before even creating it. 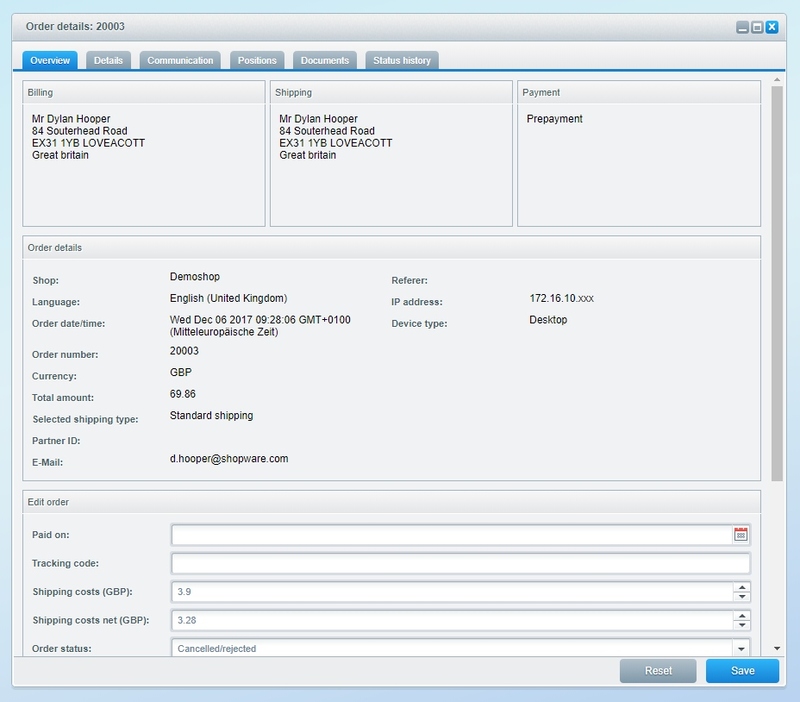 For example you can add a voucher (4) or an invoice number as a reference for the reversal invoice. The selected voucher will be displayed in the lower area of the document. Keep in mind, you can exclusively use individual vouchers here. In case foreign customers have provided a turnover tax ID, you are able to issue invoices without the inclusion of turnover taxes. In order to create a tax-free document, you should tick the tax free (5) checkbox. The then created PDF-document will not show taxes , but calculates solely net values. The field Invoice number is not meant for individual invoice numbers. This field is only used for referencing an invoice number in a reversal invoice! After creating the document, you can deliver it to your customer via e-mail by clicking the letter-icon (6). 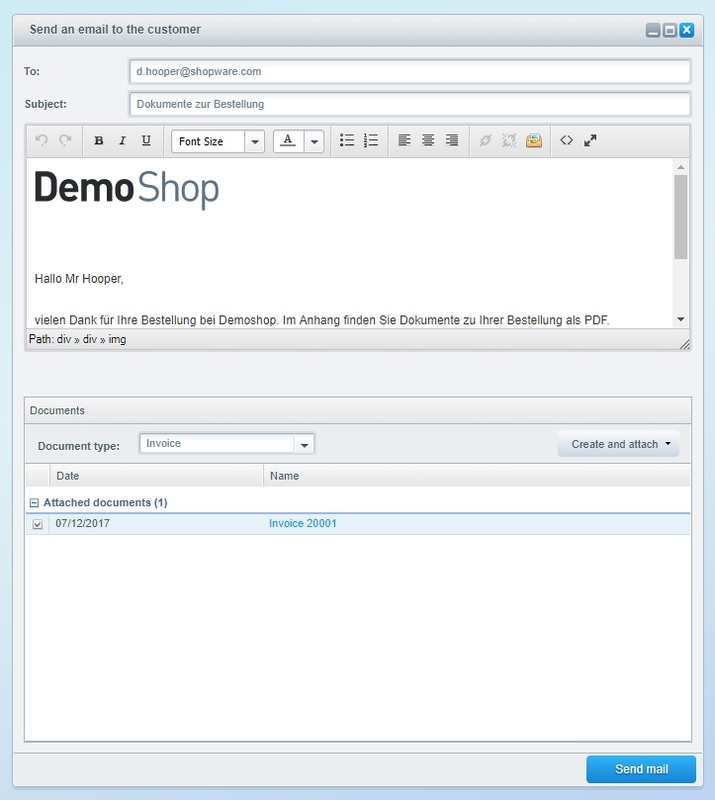 A pop-up will open, displaying the e-mail template "Documents for your order" and directly attaching the document. Click Send mail to get the e-mail delivered to your customer. In the status history all status changes will be logged. This way you can always see, which backend-user made changes to what statuses. 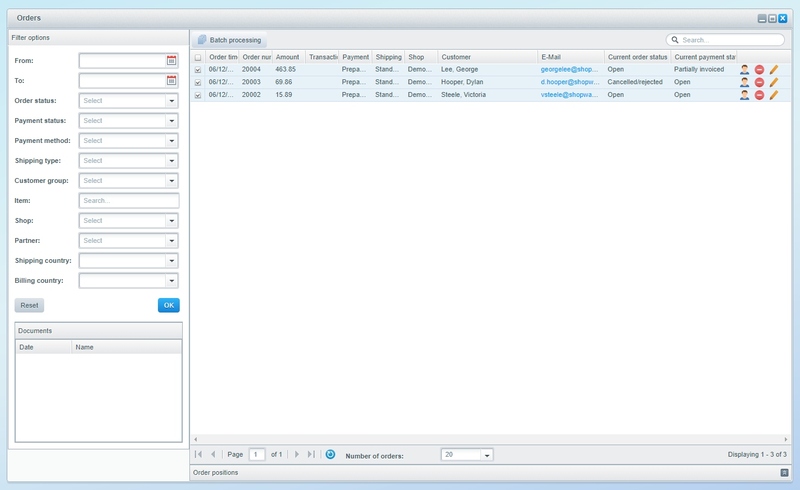 Batch processing lets you edit / process multiple orders at once. This is useful if e.g. you want to change the status of multiple orders at once or you want to create different documents at the same time and also send them all at once. Document type: If you want to create/send documents, choose the document type here. Mode: When creating documents, choose the mode here, you can re-create all documents or create only non-existing documents. Order status: Choose the order's status. Payment status: Choose the payment's status. Send e-mails automatically: If you want to send e-mails to your customers automatically, activate this checkbox. Add documents to e-mail: If you want to send e-mails containing attachments, click this checkbox. Keep in mind, that this option is only available, if you the option "Send e-mails automatically" is set active and a particular "document type" is chosen. Create single document: Activate this checkbox, if you want to create a single document containing all the previous ones. This is used e.g. for printing a whole day's invoices or delivery notes at once. After setting up your batch process, click Process changes to initiate the batch process. The logic behind the batch process demands you to choose a document before adding attachments. That is why it may happen - depending on your configuration and situation - that no e-mails are sent, no matter if the checkbox is active or not. 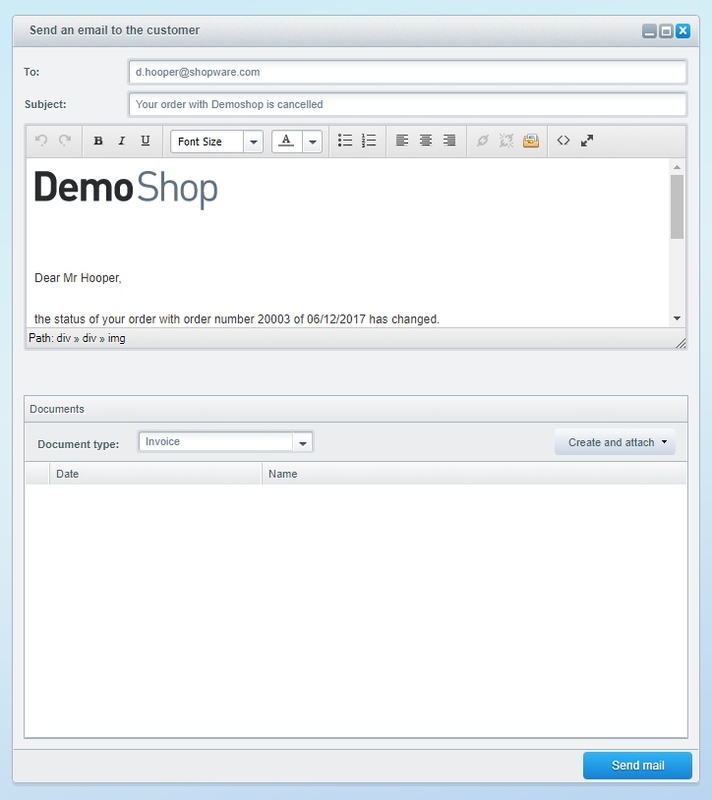 In this case Shopware prevents you from sending duplicate e-mails to your customers. Keep in mind, that partial cancellations are not officially supported and only possible by utilizing the following workaround. 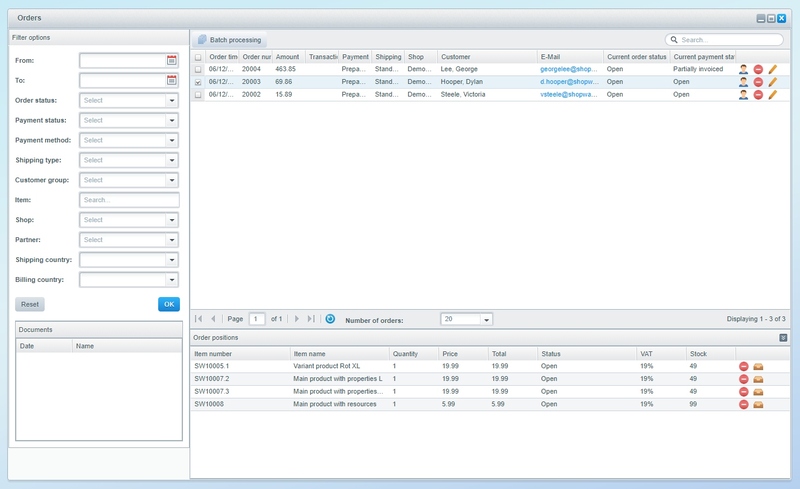 If you still need a solution for partial cancellations, take a look at this Shopware ERP powered by Pickware. To cancel a part of your order, set the affected products to the status "Cancelled". To create a correct cancellation document, set the quantity of the not cancelled positions to 0. After generating the document you can set the positions to the initial quantity again and set the cancelled positions to 0. You also have the possibility to delete the whole position by clicking the "delete"-icon or by selecting the respective positions and click "Delete all selected". The status of the position is for internal use only and will not be processed or edited by Shopware afterwards. 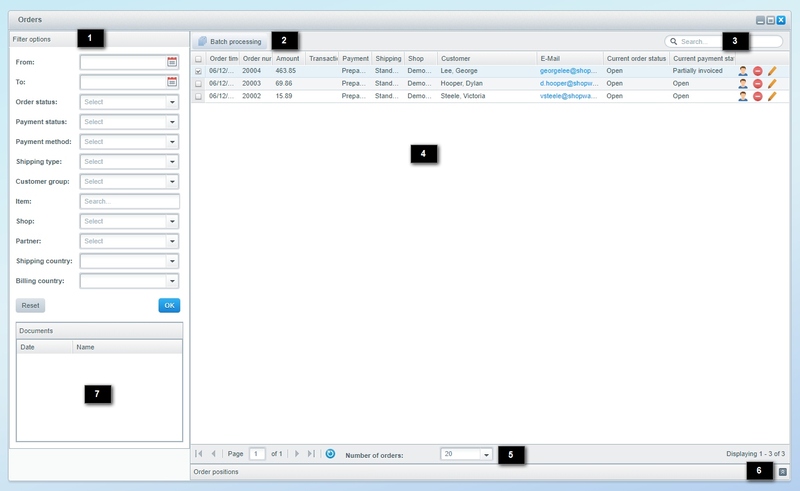 You can edit the e-mail template in the E-mail templates module, where you can edit all the templates. You can edit the document templates in the PDF document creation module, where you can edit all the templates.